Juliet Bouverie, Chief Executive of the Stroke Association speaks at Cass. 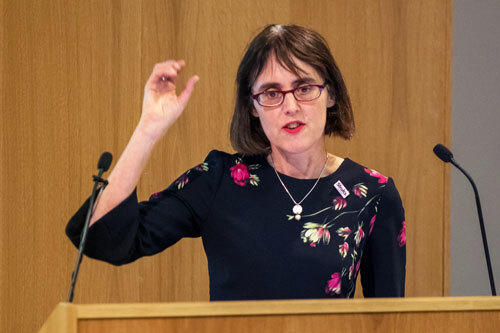 Cass and the Centre for Charity Effectiveness (CCE) were pleased to welcome Juliet Bouverie, Chief Executive of the Stroke Association to speak at Charity Talks. Juliet was joined by our Dean, Professor Marianne Lewis. The talk was chaired by Professor Ian Bruce CBE, President of Cass CCE. 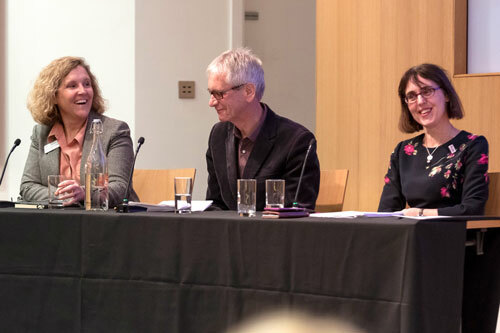 Her topic on ‘Managing and leading inside non-profits’ gave all who attended great insights into Juliet’s career as a leader in the charity sector. She regaled the audience with stories from her own leadership journey, highlighting some of the difficulties managers encounter when they transition into leaders. She also spoke about the importance of ‘human’ leadership and that hierarchical, ‘top-down’ strategies do not work. Throughout my career, I’ve learnt the value of BHAGs (Big Hairy Audacious Goals)… if we don’t set them, and inspire action behind them, we don’t achieve transformational change. Before Juliet became a chief executive, she was told that her biggest career transition would be from functional director to CEO. The challenge of managing multiple stakeholders, being accountable to trustees would be a huge and challenging jump. “I quickly realised I wasn’t in control. I was working in the uncertainty space that leaders inhabit and I learned that I needed to do two things. One was to trust and empower others by distributing leadership - command and control style leadership doesn’t work. Secondly, was to feel comfortable with ambiguity – holding more than two truths at any one time and not being binary. It’s not going for ‘either-or’ solutions but choosing ‘both-and’." Juliet joined the Stroke Association in 2016. Prior to this, she worked at Macmillan Cancer Support for 16 years in roles including head of planning and policy, director of corporate development and executive director of services and influencing. In her last role at Macmillan Cancer Support, she secured important government commitments to improve patient experience and post-treatment support through the 2015 Cancer Strategy for England.